There has been quite the trend going around the food world. 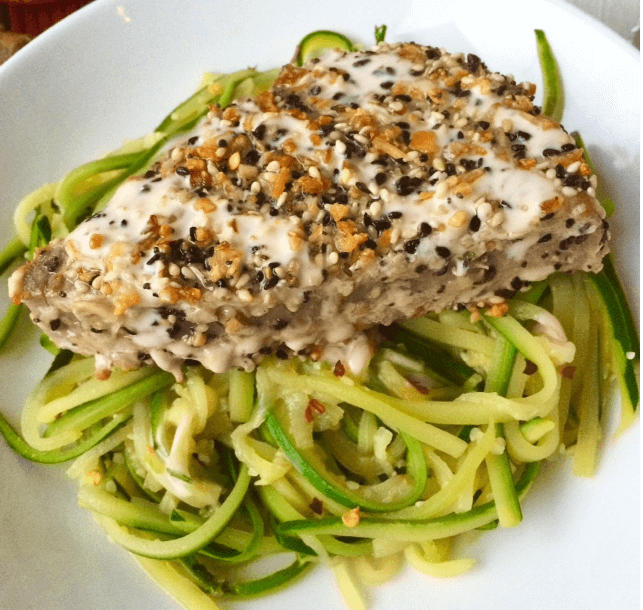 I am sure many of you have heard the term Zoodles or of the new “spiralizer” gadget. It seems that people have discovered a healthier way to eat noodles- and I am on board. I was skeptical at first, but after trying them myself, I am officially a “Zoodle” fan. I, unfortunately, do not own a Spiralizer. BUT, I was able to create these delicious zucchini noodles on my mandolin. I just put in the wide julienne insert and adjusts the thickness to my liking- voila! I am excited to try some other vegetables! The Asian flavors were absorbed into the zucchini noodles much more than they would have been with rice noodles. It is important that you don’t overcook your zucchini noodles, or they will lose that nice crunch. I could have eaten a huge bowl of just the noodles and been satisfied. Although, if you like your proteins, like me, try adding the sesame seared tuna. I felt like I was eating out at a nice restaurant! Combine the soy sauce, ginger, garlic, vinegar, orange juice and honey in a small pot. Bring to a boil, then remove from heat and let steep for 15 minutes. Heat the coconut oil over medium-high heat. Add the zucchini noodles and sautee until they begin to soften. Add the orange-ginger sauce to the pan and toss. Remove from heat until ready to serve. For the tuna, baste the steaks with 1 T coconut oil, season with salt and pepper, then coat with sesame seeds. Heat the remaining 2 T coconut oil over high heat. Sear the tuna steaks on each side until desired level of doneness (about 4 minutes on each side for rare). 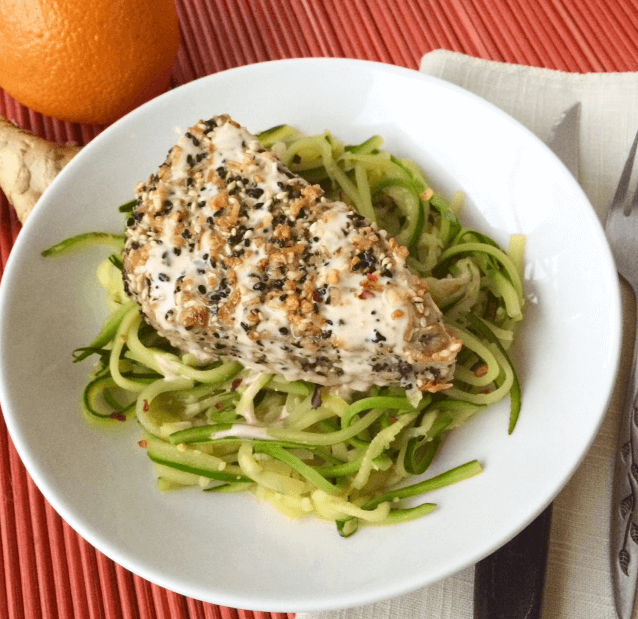 Serve over orange-ginger zucchini noodles.